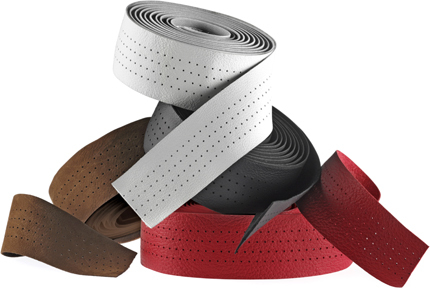 Smootape leather bar tape offers you the perfect grip in a range of colours. The tape also eliminates the imperfections from overlapping ensuring the taping is smooth. If you love that Classic look, this is the tape that needs wrapping around your bars. The perfect handlebar tape with that classic look and feel. Selle Italia Smootape Classica Leather Handlebar Tape is rated 2.9 out of 5 by 8. Rated 3 out of 5 by Quattro1 from Nice taps but too thin Bought this thinking I was going to get some new 'spongy' tape on my base but it's too thin. Looks like good quality but not what I really wanted. Rated 1 out of 5 by Pahorpe from Very poor quality I don't recommend this tape. It looks god but for regular riding is useless. It gets very ugly and moves on the bar when wet. And in the end it tore apart after one month of riding (2-3 times a week). Rated 3 out of 5 by Handbrake42 from Die stains your hands... I bought this tape to go on a classic looking steely... if you intend to use this tape on a bike that may go on a turbo, give it a miss. The sweat from your hands causes the die to run and you end up with stained hands, that doesn't wash off. Only bought as Brooks leather was out of stock. I have now replaced the tape for books leather. Other than that nice it's quite nice. Rated 4 out of 5 by Palpatine from Good but colour changed Bought as a good colour match for Selle italia nubuck saddle. However colour darkened very quickly, so no longer matches. Doesn't ruin the performance though.